Click on the link below to gain a list of explorers and some background information to help you decide an explorer for your project. Click on the explorers drop down menu for the entire list to choose from. Here are some examples of what your assignment should look and sound like. Click on them for a reference. Read the passage below to get a small idea of what Asia is all about. Asia had several of the first complex civilizations, which have given us stunning cast bronze pieces, cave paintings and statues that can still be seen today, in addition to the tremendous amount of art and literature that has disappeared over the centuries. 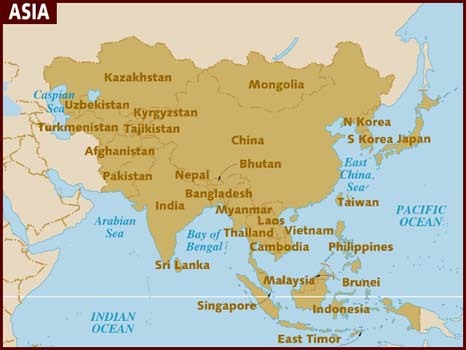 Between India and the Tibetian plateau are the Himalayan mountains, the tallest mountain range in the world. Fourteen peaks in the Himalayans are over 8,000 meters (26,247 feet); no other mountain peaks in any continent are that high. Major rivers—the Ganges, Indus, Yangtze, Yellow, Mekong, and Brahmaputra rivers start in the Himalayas, watered by the monsoon, and flow into the Indian Ocean or the seas that become part of the Pacific Ocean. The island of Taiwan was not taken over by the communist forces in 1949. Several million refugees fled there. The government of China is a continuation of the Republic of China which ruled China prior to the communist revolution led by Mao Tse Tung. China claims that Taiwan is merely a rebellious province. Taiwan formerly claimed to be the legitimate ruler of all of China. Taiwan does not claim to be a sovereign state limited to the island of Taiwan. Click on the link below to review what the 5 themes of geography are and how they can apply to identifying information about a country. There are 2 power points to look at to review. Please click on the link below to find the information for you to fill out on your table that is glued into your interactive notebook.